Mike Babcock addressed the media after practice on Tuesday, discussing the nearing return of Auston Matthews, Andreas Johnsson’s recent play, lineup changes once Matthews and Nylander are back, and more. Are the prerequisites in place for Auston to make a return? Babcock: I’m not sure. Pauly (Head Athletic Therapist Paul Ayotte) and him haven’t sat down and gotten that all straightened out. We’ll know more tomorrow morning. We’ll see how he does. It wasn’t a long practice or anything, but he looked fine out there today. We’ll see how he is. How much of a jolt to the lineup is he? He’s had success when he’s come back from previous injuries. Babcock: He’s a real good player and we’d like to have him back. He’s worked hard and had the opportunity to work hard this time, which I think is really beneficial to him. There is always the initial energy and then the grind starts. But he’s a real good player and he can help us. What’s been the key to success to go 9-5-0 without him? 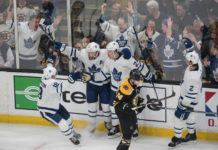 Babcock: We have good players. It’s never about one player. It’s about the team and how you go about doing your business. I think we’ve got good leadership and the guys have done a good job that way. We’ve worked hard most nights. We’ve had a tough schedule here. Any time you play five-in-eight back to back, it makes it hard. I don’t think our energy level in the second five-in-eight has been the same, but ideally, today and the next few days, we’ll get back and playing like we can. The way Kasperi Kapanen and Andreas Johnsson have contributed and played so well, will that make your decision difficult with who Auston is going to play with? Babcock: To be honest with you, I haven’t thought about it. Until they tell me he is playing, this is just us talking about it. When he is available, I’m sure we will find him some linemates. The ability for Mitch Marner to see the ice as well as he does, is that innate? It can’t be coached, can it? Babcock: Obviously, he’s a real good player. He’s got real good sense and real good edges. He creates time and space like no one else on our team, for sure. I don’t know why he has that ability. I just know we are lucky to have him. What I like about him is how hard he works. We started with 3-on-3 today. Him and Mo were flying off that bench with energy and jumping. They’ve got energy. I think that makes a huge difference. When top guys come back, generally, the opportunity dries up for some guys that got more when they were gone. Is it hard to keep them engaged afterward? Babcock: I wouldn’t think so. It is the National Hockey League. I think it’s all about understanding what your lot in life is and being the best you can be at it. I think momentary disappointment when things don’t go well is fine for everybody, but the rest of it is a waste of time. You’ve got to dig in and play. Our guys all know he is going to be here. I expect Willy will be here, too, I expect. There are going to be other guys not playing. It’s all part of being on a team and doing what you can to help. Andreas Johnsson was a healthy scratch earlier in the year. How much different of a player does he look to you now? Babcock: Two nights ago or last night? There was a point in that. Every single night in the league, you’ve got to be whatever you are. You’ve got to figure out over time what your level watermark is. He is getting better. Obviously, he’s feeling more confident. He’s got to continue to do that to have success. I felt good. I think guys took it, for the most part, easy on me. But just in those battle drills and competing, everything felt good. In my mind, I feel ready to play tomorrow. I’ve still got to talk to the medical guys, but as far as I’m concerned, I feel pretty ready to go.